I have had more than 20 years of instruction from various trainers in the Olympia area. Then In 2007, I started working with Mark Rashid, Kathleen Lindley and Kyya Grant, all Mark Rashid-style trainers, To learn more about Mark Rashid's training philosophy, go to www.MarkRashid.com. the owner, because if the rider isn't giving consistent instruction to the horse, the horse will behave for me, but may not understand the owner's communication. Therefore, I suggest that I either work with the horse and owner together, or that I work with the horse on my own, with periodic lessons with the owner as well. My specialty is problem horses. I have effectively helped people with problems that range from catching the horse to trailer loading; from spooking problems to biting and kicking. People have occasionally called me a horse whisperer, but I just try to understand the horse, and help it to feel better about doing what is asked. Individual hourly fees are $50. Additional fees apply if travel time is more than a half hour. 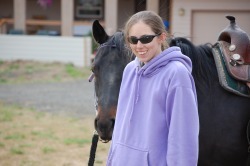 Monthly horse training fees (paid all at once for 4 weeks). This would be training at your facility. Training fees include sessions to work with the owner. Occasionally I have room to take horses in for training. The monthly training fee, which includes full-care horse boarding and working with your horse 4 times per week, is $700 per month.